With Zebra’s innovative ZXP Series 8 retransfer card printer line and ZMotif software platform, create on-demand plastic cards with picture-perfect image quality that meets your brand and quality requirements. To achieve this superior image quality, the printer uses image processing algorithms based on Zebra’s photo printer technology. This new generation of card printer increases your operational efficiency without sacrificing image quality through the printer’s best-in-class throughput, provided by Zebra’s patent-pending simultaneous dual-sided image transfer process. The printer’s modular design provides flexibility to add a variety of encoding options as needed. And its high reliability minimizes your printer maintenance needs and total cost of ownership. 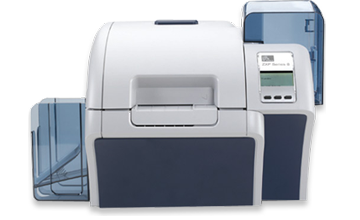 In addition, ZXP Series 8 printers include ZMotif XML-based software for easy system integration and faster deployment and return on investment.